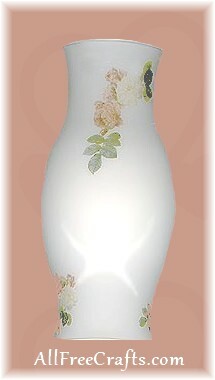 This decorative hurricane glass is decorated using a reverse decoupage technique, whereby the decoupage material is apply to the inside of an object, rather than the outside. Decoupage can be applied to all sorts of surfaces, but none are as spectacular as glass. The photo can’t show how wonderful decoupage prints appear under glass. This project is a hurricane globe, but you can follow the same techique on most glass. Tea light candles, placed inside a votive, are recommended for this project. This method can be applied to any glass surface, but be sure to follow the manufacturer instructions for the paint you use. Most paints can’t be used where food will be placed. Choose a photo, gift wrap, etc to use as your decoupage print. Using a craft knife (scissors can be very difficult for small prints), cut your picture cleanly. Drop your picture into a tray of water. It will at first curl up and then flatten. As soon as it flattens, remove from water and pat dry with a paper towel. This technique will relax the paper and prevent it from wrinkling when you apply it to your glass. Apply glue to the full surface of the front of the image and place on the inside of the hurricane lamp (the picture will show through the glass). Apply as many images as you like and they may overlap each other. Once your image is in place, apply an even coat of glue over the back of the image and allow to dry completely. Now that all the glue is dry, with a small amount of window cleaner, remove any glue that is sitting on the glass. The glue will remove easily with a paper towel dipped in glass cleaner. Allow to dry completely. Paint the entire interior area of the hurricane globe with cream coloured paint. Allow to dry at least 24 hours. Repeat painting until you can no longer see through the paint. Depending on the paint you use, this could take any where from 3 to 5 coats of paint. If you plan to burn candles inside this hurricane globe, place your candle in a protective votive inside. Tea light candles are recommended for this project.